The images above, showing the front cover of the cassette and the inlay. These small images are both links to 150 dpi scans. 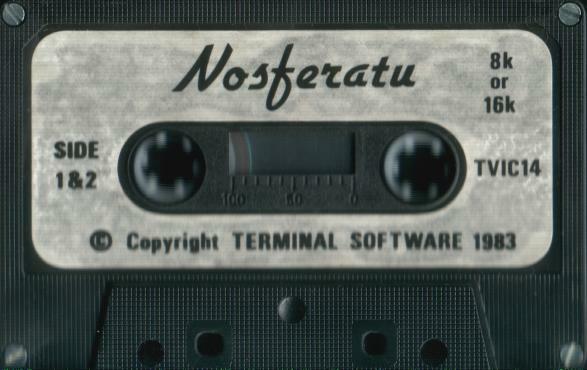 A 150 dpi scan of the actual cassette. An image of the original game as a .TAP file which can be loaded into emulators such as VICE. The BASIC source code that I managed to extract from the .TAP file by sticking my fingers down its throat. Remember, I wrote this after three years of BASIC and no other programming, so be gentle with it. 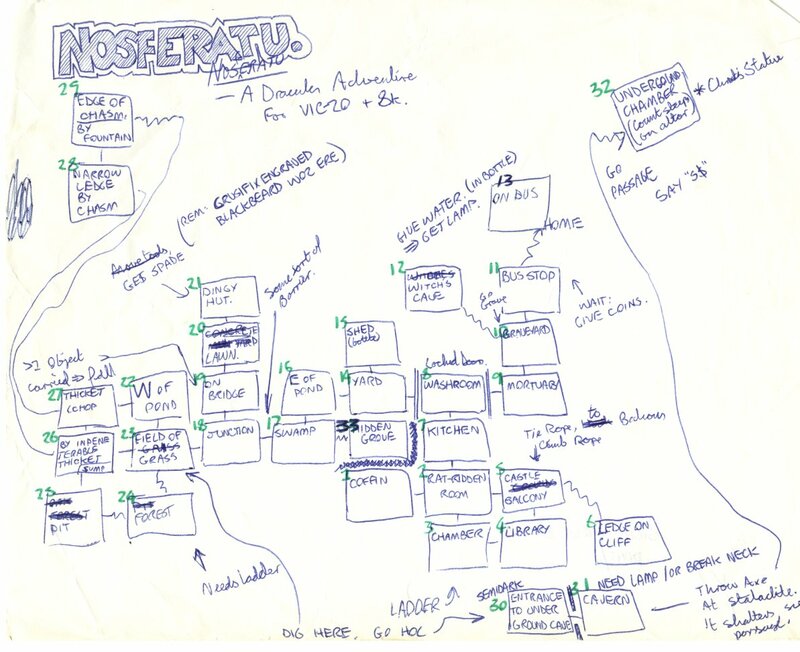 A scan of what I think is the original map that I drew when planning the game, and that I worked from as I was writing it. An ASCII-art map of the game as it actually turned out: very similar, but not identical, to the original. A step-by-step solution to the game. 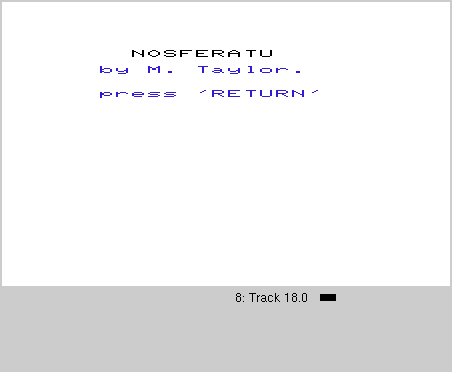 An Amstrad CPC port, made in 2017 by Carsten "SRS" Dost, which can be run under WinAPI (for Windows only) or on JavaCPC. 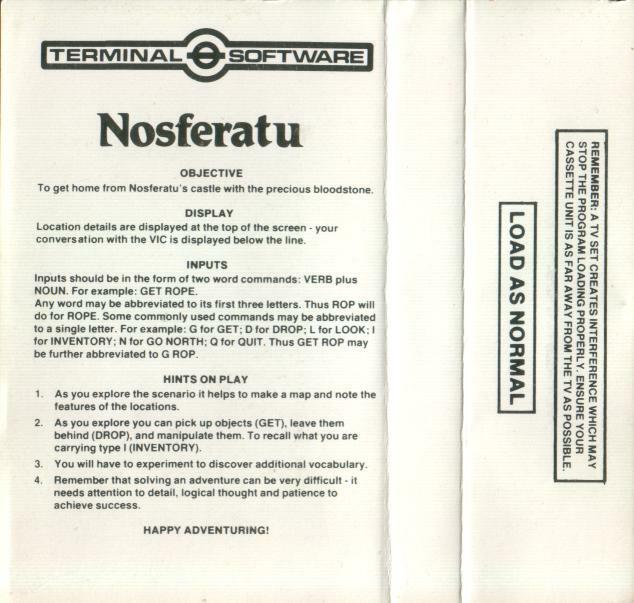 Nosferatu was my follow-up to Magic Mirror, and like its predecessor was published by Terminal Software. The game took its title from a Blue Oyster Cult song I was fond of (and actually I still love it, and urge you get a copy if you can. It's on the Spectres album.) To my eternal shame, Nosferatu lacked Magic Mirror's save game facility. I don't know what I was thinking, and I can't imagine how Terminal let me get away with it. 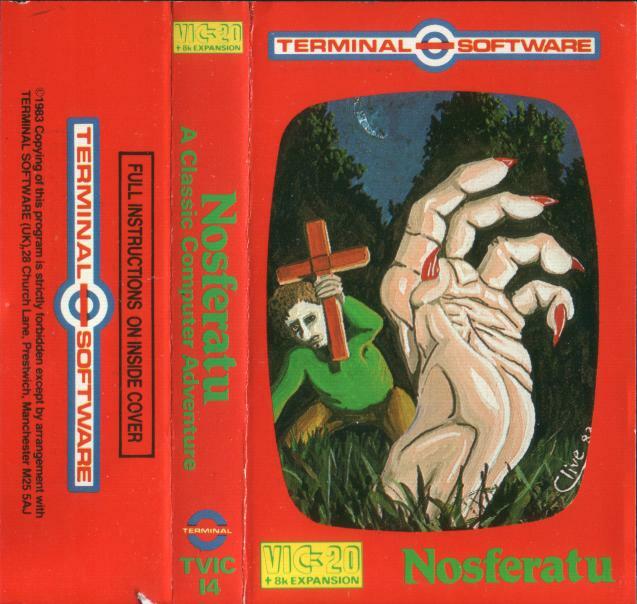 This game took a lot of its puzzles from the unnamed Dracula adventure that I co-wrote with Myles Kelvin, and we went together to a conference in Manchester organised by Terminal Software. That made us feel very grown up at the age of fourteen or fifteen! Ah, the thrill of being allowed to drink beer! The most interesting thing about this game now is that I forgot to take out the debugging code before sending off the final version: the result is, anyone could type (for example) ``i= 5'' to teleport to location 5! The verb was called ``i='' because the ``which location I'm in'' number was stored in the variable ``i''. You could find out the number of your current location with another debugging verb, ``?i'', meaning ``print i'', because ? 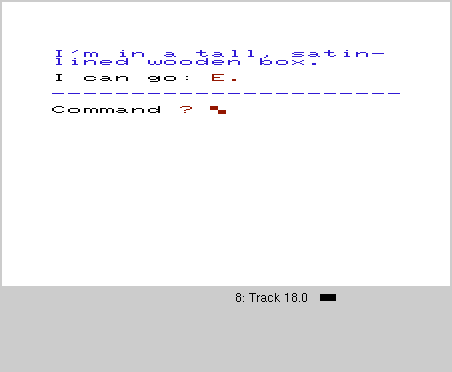 was shorthand for the print keyword in Commodore BASIC. The whole game gets by using just the four principal compass directions: there are no UP or DOWN exits from any locations. The introductory screen may be the most boring of any game ever. The start of the actual game wasn't particularly dramatic either, but then nothing looks dramatic in a 22x23 character screen. Come to think of it, the ending lacked a certain drama, too. Contrary to all expectation, winning the game didn't involve killing the vampire, and the final screen you see on winning the game is in response to the decidedly unheroic act of buying a bus ticket. 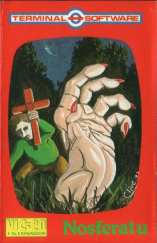 Along similar lines, the game's witch could not be provoked into doing anything remotely dangerous, despite the rather melodramatic BEWARE THE WITCH carving on a tombstone. In fact, the game's main danger is probably that of falling into a disused cesspit. Clearly I'd researched my vampire mythology pretty exhaustively. The game has a couple of embarrassing typos: most notably ``crusifix'' for ``crucifix'', and ``inpenetrable'' rather then ``impenetrable''. Again, I blame the publisher. 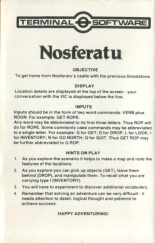 When I wrote this, I'd never played Scott Adams's The Count, which at the time I think was the only other Dracula-themed adventure on the market. To my chagrin, when I eventually did play it, I found that one of the first puzzles involves tying sheet to a flagpole and climbing down it. So the very first Nosferatu puzzle, of tying the rope to the balcony rail and climbing down it would have appeared horribly derivative to anyone who'd played The Count. Coincidence. Honestly. If all of this leaves you with the impression that I don't think much of the game, I suppose that's true. But I still regard it with affection because, well, I was fourteen. Cut me some slack.